The Journey Home Strategy is Kelowna's 5-year plan to address homelessness with a focus on ensuring everyone has a place to call home. The goal is to ensure a coordinated and easy to access system of care for those in Kelowna who have lost, or are at risk of losing their home. The Community Report is designed to provide an overview of the Strategy and how it was developed. The Technical Report is a deeper dive into the exploration of Kelowna’s unique challenges and strengths which form a roadmap to implement the strategy. For a brief overview, check out the Journey Home Strategy at-a-glance. You may have heard that a key principle in the Journey Home Strategy is Housing First. This session will demystify what Housing First is by exploring the Housing First philosophy and the Housing First program model. If you have ever wondered what Housing First is, how it works, and why it is an effective model, this is your chance to learn more. Bring your questions! This session is the result of collaboration between the Central Okanagan Foundation, as the Community Entity (through the Federal Homelessness Partnering Strategy), Canadian Mental Health Association Kelowna and the Canadian Alliance to End Homelessness. Location: Trinity Baptist Church, 1905 Springfield Rd. 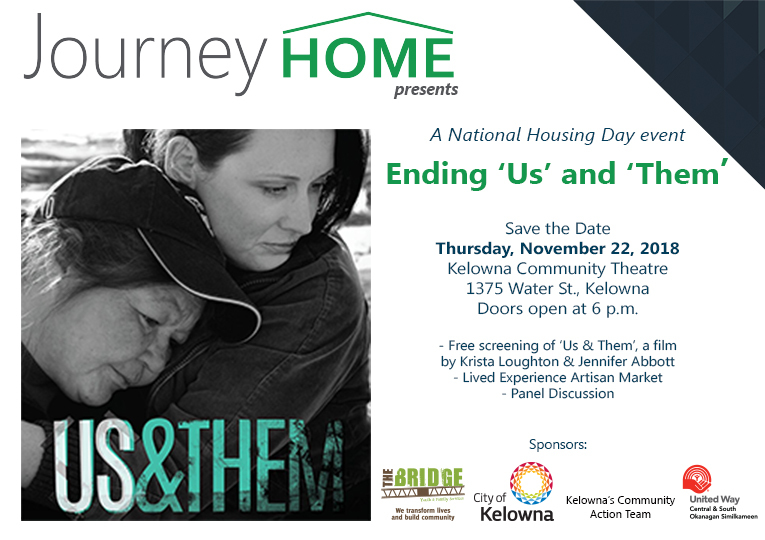 Join us for a day to hear from people with lived and living experience of homelessness about their hopes and expectations in implementing Kelowna’s Journey Home Strategy and how we as a community can measure our progress towards ending homelessness. The morning will be spent highlighting the experiences of individuals with lived experience, and provide an overview of the dimensions and indicators to successfully end homelessness. During the afternoon, we will focus on co-developing measurable indicators to measure and evaluate our progress towards achieving the outcomes set out in the Journey Home Strategy. This initiative is part of the Making Zero Count project – an initiative aimed at supporting communities to identify what an end to homelessness looks like in practical terms and what planning supports are needed to get there. Your feedback and expertise will go towards refining a national definition of an end to homelessness, through the Making Zero Count project with the Canadian Observatory on Homelessness. Please join us at First United Church April 28 @ 2 pm for a FREE screening of the documentary "Us And Them", a film that follows the lives of four individuals who lived on the streets in Victoria, BC. Filmed over a decade, "Us and Them" is a deeply visceral film about transformation through human connection. We present this film to challenge our perceptions and to further an understanding of homelessness and addiction. It is also an opportunity to support the work of the Journey Home Strategy that addresses homelessness in Kelowna. A panel of folks who have been or who are homeless will respond to questions following the film. Presented by: First Mennonite Church, First United Church, Okanagan College Faculty Association Human Rights & International Solidarity Committee, St. Andrew’s Anglican Church, St. Mary’s Anglican Church, St. Paul’s United Church, St. Vincent de Paul, Journey Home Society and the School of Social Work UBCO. The process for developing the Journey Home Strategy was designed to be community-driven and inclusive. Since the Journey Home engagement process began, we have heard valuable input from the community with over 2,000 points of engagement through community summits, design labs, public surveys and the Lived Experience Circle. For more on the process, review the Journey Home summary document. The overall strategy proposes 35 specific actions to be implemented over the five-year span of the strategy. Within these actions, ten have emerged as highlights that demonstrate the commitment to change. Rollout a Backbone Organization solely dedicated to implementing the Journey Home Strategy by building community capacity and engaging in systems planning. Support the addition of 300 units of long-term supportive housing in purpose-built buildings targeted to support people experiencing chronic and episodic homelessness with higher needs. Support people in the rental market through 500 new program spaces grounded in the Housing First model and the right to housing. Continue the Lived Experience Circle and Youth Advocates for Housing and formalize relationships to the Backbone Organization governance. Recognize accountability for the Truth & Reconciliation Commission's Calls to Action in that Indigenous Homelessness is an ongoing form of colonialism. Launch the Upstream for Youth pilot in partnership with the School District to identify and support youth at risk of becoming homeless. Support efforts to increase treatment beds, especially for young people in Kelowna. Support innovative solutions to address the criminalization of homelessness such as a Community Court. Ensure a population focus is embedded in Strategy implementation; this includes youth, Indigenous, women, families, newcomers, LGBTQ2S+, seniors and men. Launch a Homelessness Innovation Lab to partner with the technology sector to develop solutions for information management and access, and data analysis. ​Watch the full video series on YouTube. The Journey Home Transition Team plays a vital role in maintaining community momentum and moving the strategy forward into implementation. The primary task of the Transition Team is to establish the Backbone Organization, including designing and establishing the governance structure; building an advocacy and funding strategy; securing funding; and building the foundation for the Backbone to form partnerships, and enter into agreements with community agencies and organizations. The Transition Team will work alongside the Youth Advocates for Housing and the Lived Experience Circle on Homelessness to design the Journey Home Backbone Organization governance structure to ensure the voice of lived and living experience continues to guide and be at the forefront. In order to provide diverse representation, the Transition Team is comprised of stakeholders representing a diversity of sectors, skills, knowledge, experience, along with a strong interest in homelessness prevention and the provision of affordable housing. The Journey Home Transition Team is not a Committee of Council. The Journey Home Task Force is a group of community members appointed by Kelowna City Council who are working to move the Journey Home strategy to reality. The Task Force’s goal is to lead the development of the long-term Journey Home strategy to ensure people experiencing homelessness in Kelowna have a clear path to the support they need, when they need it. The Task Force will be supported by Dr. Alina Turner and Turner Strategies. Dr. Turner led the implementation of Canada’s first Homelessness Management Information System and has worked with a number of cities across Canada including Victoria, Edmonton, Calgary and Yellowknife on their plans to end homelessness. Turner Strategies has also partnered with the Canadian Observatory on Homelessness and A Way Home Canada to prepare Kelowna’s Journey Home plan. The Journey Home Task Force meetings commenced with an orientation in late September 2017. The Task Force will continue to meet on a monthly basis through to the completion of the Strategy in 2018. A Way Home Kelowna (AWH Kelowna), is guided by a steering committee with membership from the Okanagan Boys and Girls Clubs, Canadian Mental Health Association - Kelowna, The Bridge Youth & Family Services, Westbank First Nation, United Way, City of Kelowna, the Ministry of Children and Family Development, and the Central Okanagan Foundation. Implement innovative models of youth engagement, empowering young people with lived experience of homelessness to be partners in transforming coordinated responses to youth homelessness. How are youth with lived experience involved? Just over 50 youth (12-25 year olds with a diverse range of lived experience) have been engaged to date through focus groups and one on one sessions. Youth identified that there's a lot of good work happening in Kelowna. Findings will be worked into the youth strategy implementation. LECoH is currently made up of ten individuals that meet every two weeks, working alongside Journey Home. 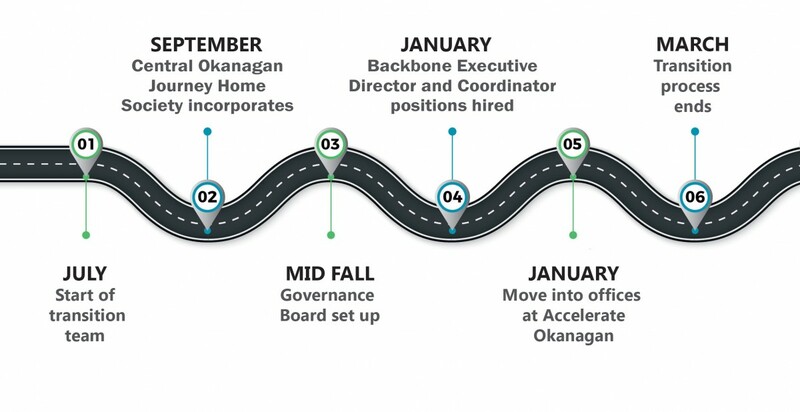 The Circle will have a seat on the newly formed Central Okanagan Journey Home Society Board of Directors in order to continue to provide guidance in the implementation of the Strategy. The members will come together regularly and will be asked to provide insight on the strengths and gaps in the current homeless serving system. If you are interested in sharing your expertise through the Lived Experience Circle, please email Journey Home. While the City has taken a leadership role in the development of the Journey Home Strategy, an inclusive community driven process is essential to ensure a collective commitment to move the plan into action. Hiring a Social Development Manager in 2016 was one of the first steps in a process to bring together partners within the community to help address the growing issue of homelessness that is occurring across the country. While no one individual or agency is able to solve these complex social issues on their own, this dedicated City presence will contribute to the joint efforts of government, community groups, businesses and social agencies to address our community’s issues and develop a coordinated, strategic approach. More than 50 community partners are working to address issues around housing and homelessness. Below are a few examples of programs making a difference one person at a time. A transitional storage program in partnership with the City of Kelowna, BC Housing and Gospel Mission. In the first six months, 32 individuals who accessed the storage program have moved on into housing. An increase of 26 individuals began using the shelter system for the first time after accessing the storage program. For people living without homes, being able to store their belongings can be transformational. It offers an opportunity to connect with services like appointments and meals, without fear of losing their belongings. Meet Geoff Haney, a Leon Street Worker at the Gospel Mission. BC Housing is leading work with local service providers to use a coordinated approach to assess individuals’ needs and to support them into housing. The organization has more than 3000 units in Kelowna. Interior Health and the Kelowna RCMP partnered to create the Police and Crisis Team (PACT). A dedicated psychiatric nurse and specially trained RCMP officer who together form the mental health and substance use crisis intervention team. PACT responded to 160 calls between March and July, 2017. With PACT responding to these calls, it helps to divert visits to the Emergency Room (ER), and connection to services through personalized attention. SEE:kelowna is a collaborative project between Metro Community and the Kelowna Museums Society. Launched in August 2017, the project shares stories from community members whose lives have been affected by homelessness. The Canadian Mental Health Association (CMHA) currently has 21 people in supported housing through their Housing First program. The organization also runs Willowbridge transitional housing (40 beds), and other housing assistance programs. "..once they're housed then they have a worker who can find them. They've got a place to store their stuff. We can start helping organize. We can connect them to brain injury services. We can connect them to those things that help them..." Keni Milne, Housing First Team Lead. The City provided CMHA a $6,500 community social development grant in 2017. This grant provided partial funding for operations. The Ki-Low-Na Friendship Society offers more than 30 culturally appropriate programs that support the community from preventing homelessness through to assisting people into housing. The organization has services and programs for all ages as well as operates housing projects. Kelowna has a lot of “feet on the street,” with City of Kelowna Bylaw Enforcement and RCMP working with Park Ambassadors, Downtown Patrol teams, private security and Transit Security to keep streets and parks clean and safe. Bylaw Enforcement and RCMP focus on making connections with people living without homes. They encourage and support them to access services while balancing the need to ensure that bylaws are followed to help keep the community safe for everyone. What's the cause of homelessness in Kelowna? There is no singular cause of homelessness in any community. Much like every person is unique, every experience that leads a person into homelessness is unique. However, there are socio economic trends that can be identified. Understanding the root causes of poverty and homelessness in our city is important to find viable solutions. Trends that have historically affected homelessness in Kelowna include peaks in population growth and housing supply, higher migration rates into Kelowna from other areas, tourism (less rentals for locals), aging populations and growing income divides. An end to homelessness - is it achievable? An end to homelessness does not mean we will never have someone who needs emergency shelter or loses housing: that would not be realistic. Our goal is to prevent homelessness; and when it occurs, ensuring it is rare, short-lived and non reoccurring. Rather than declaring an end to homelessness, many communities strive to achieve Functional Zero. This can be achieved when housing, beds and services are available for everyone who needs it. The goal is permanent housing and emergency shelters are only for temporary needs. There may always be families and individuals that will need emergency, transitional or supportive shelter. What we want is to have a response system that can act quickly to move people from homelessness to being properly supported. How many people are experiencing homelessness in Kelowna? To understand the extent of homelessness in our community, the diverse dynamics involved in homelessness need to be addressed. At any given time, the number of people experiencing homelessness in our community can ebb and flow, but there are ways we can determine the level of supports needed. We need to focus on the numbers of people experiencing homelessness throughout the year, rather than only at a given point-in-time. Extreme Core Housing Need: This number includes those in our community who may be at risk to lose their home as they are likely spending more than 50% of their household income on rental fees or housing costs, who earn less than $20,000/year. This data comes from the 2016 Census, Statistics Canada. Transitionally Homeless: those who may experience homelessness short-term, generally less than a month. Episodically Homeless: those who move in and out of homelessness. Chronically Homeless: those in our community who have been on the streets for a long time, potentially years. A Point in Time (PIT) count is a snapshot of those experiencing homelessness in our community. The data is important to identify trends and key issues related to homelessness. Policy makers, service providers and funders use the data to inform planning for housing related programs and services. Details about the 2018 Point in Time Count for Kelowna can be found here. While the Point in Time count in an important tool, it is just a snapshot of the homelessness situation at one particular time. While it may capture an accurate look at those who are chronic or episodically homeless, it will likely only capture a percentage of those who are transitionally homeless. To develop a long-term strategy and effectively plan for the future, a broader look at homelessness including those who are at risk of losing their home, needs to be considered. What are some of the solutions working in other cities? Housing First is the approach of providing housing for individuals in need without barriers due to circumstances, mental health needs or addictions. It centers on moving people who are experiencing homelessness into housing as a first priority, and then providing wrap around supports as needed. The idea behind Housing First is that people are better able to improve their well-being and address individual needs such as income or sobriety if they are first housed. What's being done to address affordable housing needs in Kelowna? Housing is a community wide issue that is being addressed on multiple levels through partnerships, land contributions, policy, zoning, grants and incentives. Partnership housing with BC Housing to identify property/building options – to address emerging needs in Kelowna, such as emergency housing and single room occupancy buildings. The City has provided land to BC Housing for seven projects including Willowbridge Transitional Housing, Cardington and New Gate apartments. Housing incentives for purpose built rental housing through grants and tax relief - the City recently increased the funding available for 2017 and 2018, as well as weighting the incentive more heavily towards family-friendly housing. Since 2001, more than $2.5 million has been directed to the Housing Opportunities Fund. From the fund, more than $420,000 in annual grants are provided to developers of purpose built rental housing. Ensuring a reasonable housing supply is available - the City continually monitors and reports development trends in our community and considers the availability of appropriate zoned land for the development of various forms of housing as acknowledged in the Official Community Plan. In 2016, 489 units of purpose built rental housing were issued building permits and in 2017, 1,083 units were issued building permits. Council endorsed the 2017 theme area for the Healthy City Strategy, ‘Healthy Housing’ - this is a joint initiative with Interior Health focused on improving health outcomes through improved housing policies and practices. Find more information using the following links: Housing in Kelowna , affordable housing and BC Housing. What is youth homelessness and why is it a necessary focus? Referring to the situation and experience of young people between the ages of 13 and 24 who are living independently of parents and/ or caregivers, but do not have the means or ability to acquire a stable, safe or consistent residence. The causes and impacts of youth homelessness are distinct from adult homelessness, as such plans and interventions must be tailored to youth. Youth experience homelessness in distinct way: they’re often less visible on the street, and more likely ort find alternative, and often temporary accommodations such as couch surfing. Many young people lack the experience of living independently and at the same time may be in the throes of significant development (social, physical, emotional, cognitive) changes. All people, including our youth, have the right to the essentials of life, including adequate housing, food safety, education and justice. What's being done to address youth homelessness in Kelowna? A Way Home - Kelowna (AWH-K) is developing a strategy and implementation plan to prevent, reduce and address youth homelessness in our community. AWH-K is being embedded into the Journey Home Strategy to ensure a consistent approach to homelessness across the age spectrum. How can I get involved or offer help? Tackling such a complex issue is a collaborative, community effort and any and all help is appreciated. All of the community input has been brought together to form the Journey Home Strategy. In addition to showing that the community is poised and ready to move forward with the Strategy, the signed pledges serve as a visual reminder that addressing homelessness effectively takes the whole community. To learn more, review the Journey Home pledge frequently asked questions. If you would like to support Journey Home but aren't sure where to start, we welcome you to reach out initially by emailing journeyhome@kelowna.ca. Check out the Journey Home mythbusters sheet to learn about common misconceptions around homelessness.